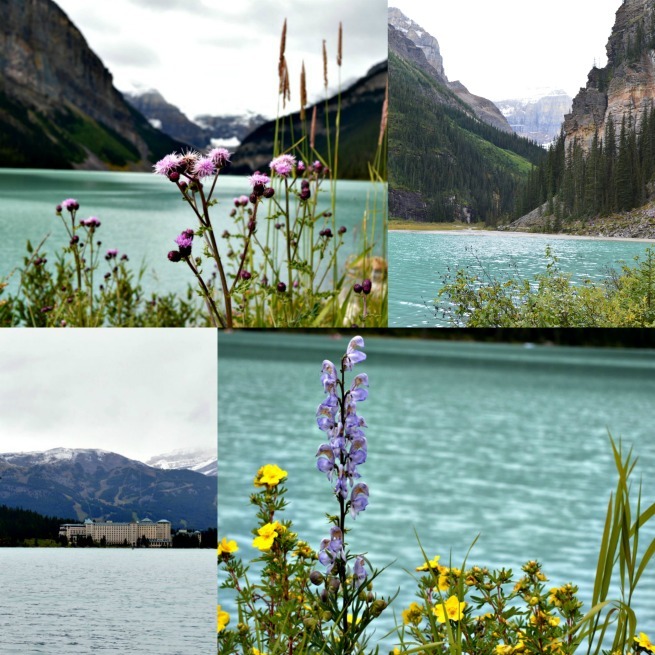 We are back from our awesome trip to Banff, Alberta. If I could summarize it in one word it would be "wow". We traveled much of the day Friday and Wednesday so really we had 4 full days to get a lot done. No matter what you do in Banff, you absolutely MUST go to Sunshine Meadows. This was my favorite hike of the entire trip. 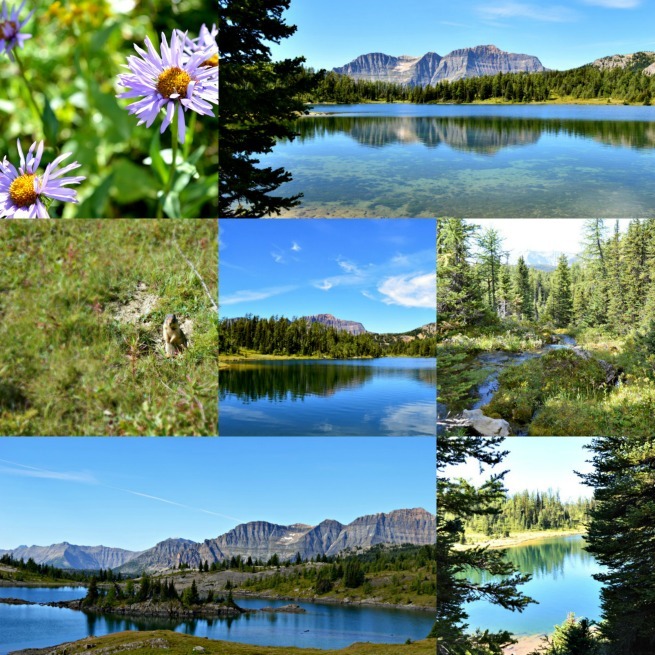 It offered stunning views of the Rockies, gorgeous wildflower meadows and great hiking. The hikes were challenging but not impossible. We did the Rock Island Lake Trail and the Grizzly/Laryx Lake Trail for a total of about 8 miles. It was tough and I had blisters (more from hiking shoes that hadn't been properly broken in) but it was totally worth it. We took the gondola up to the chair lift and then the chair lift up to the drop off point near Standish Viewpoint. The gondola to the chair lift was worth the extra cost. Trust me. I think we would still be hiking up the mountain if we hadn't sprung for the gondola trip up. And it was an amazing way to get a birds-eye view of local flora and fauna. Sunshine Meadows does have a cafe (Trapper Bill's or something like that) at the gondola exit but we opted to pack our own food and eat on some of the picnic tables around the drop off point. Sunshine Meadows is also right on the Great Divide between Alberta and British Columbia. That was cool to see! After Sunshine Meadows we decided to walk around the historic Fairmont Banff Springs hotel and then go see a couple of viewpoints around town. Check out Surprise Corner for great views of the hotel from across the Bow River and Bow River Falls. After waking up to pretty stiff muscles, we opted for a no-hiking day. 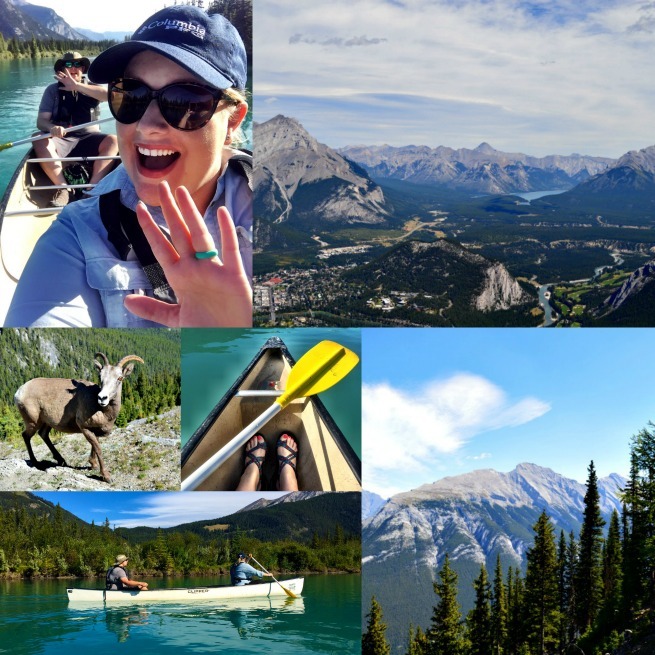 We started with renting a canoe from the Banff Canoe Club and canoeing down the Bow River. The views from the river were stunning and the water (like most of the glacier-fed water in the area) was a gorgeous turquoise color. We could actually see through to the bottom of the river which may or may not have slightly freaked me out. After a morning of canoeing, we decided to check out the Banff Gondola (Sulphur Mountain Gondola). This was also well worth the money. We took it to the top of Sulphur Mountain and were rewarded with great views of Banff and the surrounding mountain ranges. A short walk on the pathways took us up to the cosmic ray and weather observatory. These were walkways but there were a lot of steps and you're basically walking up to the top of a mountain. You've been warned. :) We saw some native wildlife in the form of prairie dogs, squirrels, a chipmunk looking thing and bighorn sheep. There was a whole herd of bighorn sheep and they were really cool to see up close! On our full day 3 (actual day 4) we had more typical Banff weather of chilly and rainy. The high was in the low-mid 50s all day. We decided to use the weather and my still-blistered feet as an excuse to do some driving. 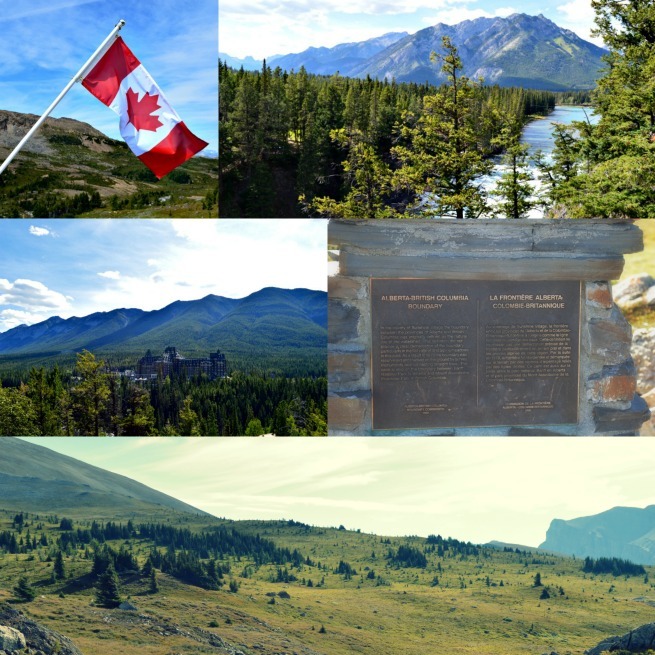 We headed out to the Icefields Parkway and did some sightseeing. The Icefields Parkway basically goes North so we watched the outside temperature drop to as low as 2 degrees (Celsius). 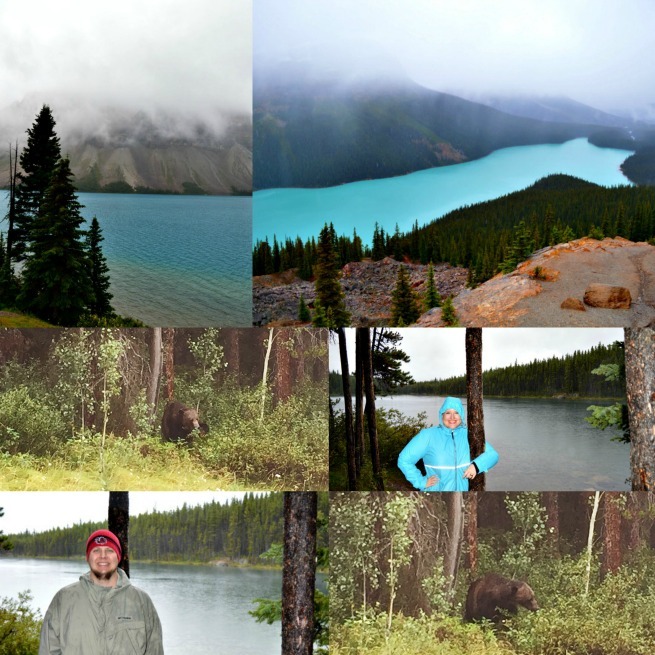 We stopped at Bow Lake (top left), Peyto Lake (top right) and Herbert Lake. On the "hike" (paved uphill walk for maybe a half mile or so) to Peyto Lake it started snowing. Yes, snowing in August. And this native Southerner was absolutely delighted at it. Though the foggy weather blocked some of the mountain views, we still got some great photos of the water. (which, let's be honest, is why people drive up there!) Peyto Lake is about an hour from Banff. 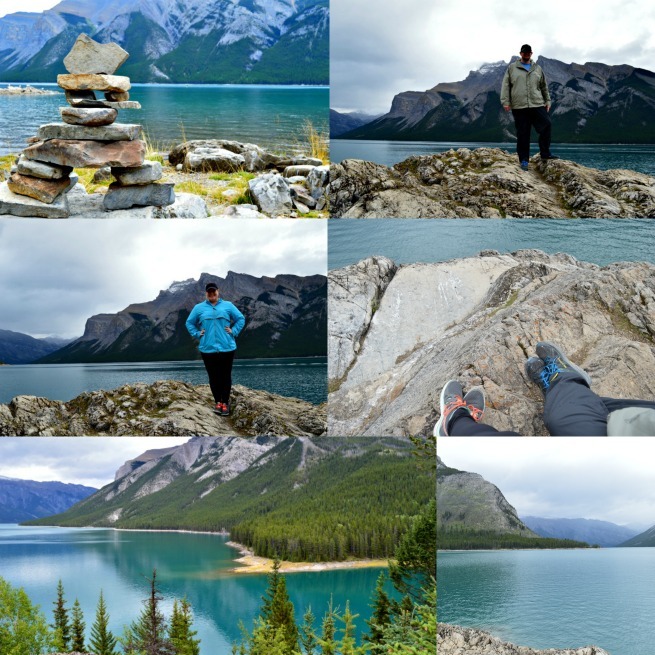 We drove up to Peyto and worked our way back to Banff from there. We had lunch in Lake Louise at Bill Peyto's Cafe, which is actually located in the Lake Louise International Hostel. Don't let that dissuade you. This little local gem was PERFECT. Though it's summer, it was chilly and rainy so M had the Alberta chili for lunch and it was amazing! Day 4 (full day 5) was the day I'd really been waiting for. It was still a bit cloudy but not raining and not quite as cold. We headed up to Lake Louise pretty early in the morning (left Banff at 8 am) to try and beat the crowds to Moraine. Moraine Lake was the place I was most excited about seeing and one of the most photographed places in all of the Banff area. The colors of the lakes and river vary depending on the amount of snow and glacier rock flour that flows into it. 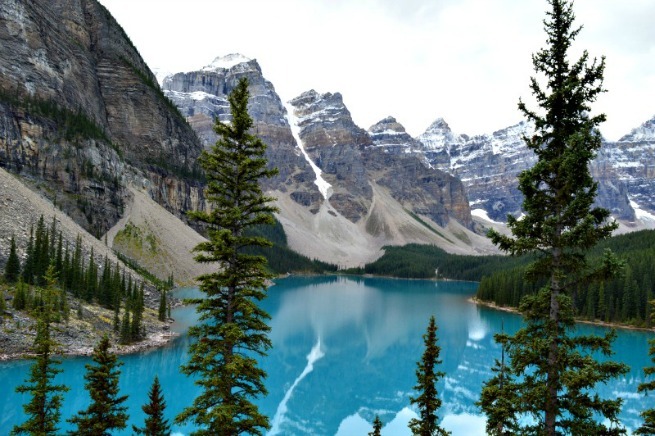 Moraine promised to be one of the most "blue" and it didn't disappoint. We did the Moraine Rock Pile "trail" (really more of just a pathway to climb the pile) to the top and the view almost took my breath away. No really. Just to prove here's a full size shot of Moraine from the top of the Rock Pile. I don't think I've ever seen a more beautiful sight in my life. We spent some time up there taking pictures and just taking in the view. Then we descended the rock pile and took a few more shots from the ground, which made the water appear darker blue. We ended this day with a quick pass by Lake Minnewanka and Two Jack Lake which are both closer to Banff. They were absolutely stunning as well! 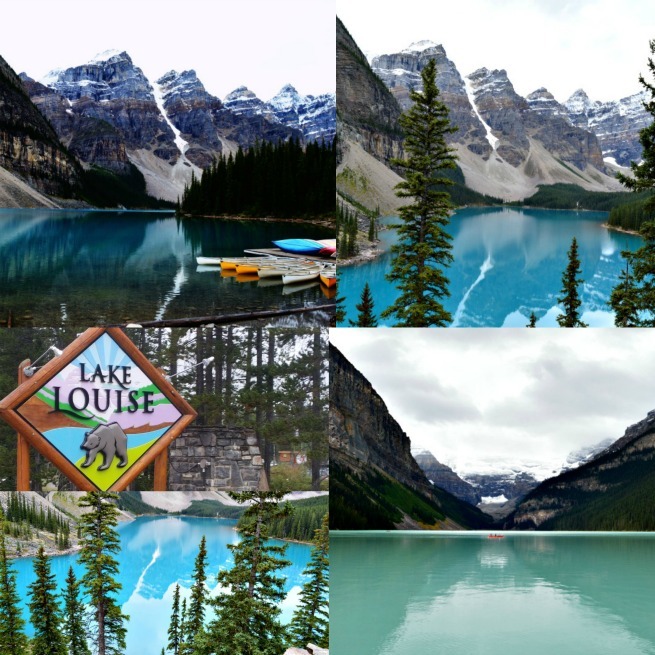 Wow, Lake Louise and Moraine are simply stunning. I didn't even know this was on my bucket list but now I need to go!! Those lakes are absolutely stunning! It reminds of of Iceland (from what I've seen in pictures). I loved all of your IG pics! I thoroughly enjoyed viewing your Instagram posts. 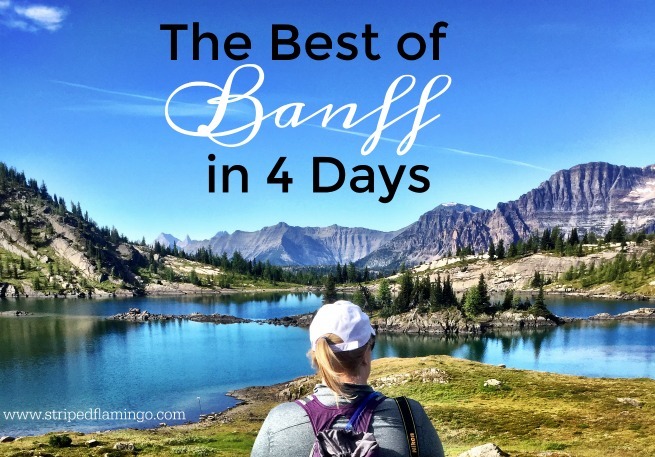 Awhile back, I had a wishlist/dream vacay post, and Banff was one of those places I listed. Your pics are proof why I want to go there. Breathtaking!